A clever and interesting Latin chart with a mesmerizing melody, composer/arranger Craig Skeffington captures it all in Trofeo de Bolos. 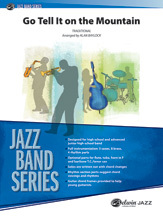 Features include: a written solo for 1st alto, lead trumpet to written A above the staff, a nice stop-time ensemble section and an open drum/percussion solo. An effective chart that is easy to rehearseÑjust what you need! Este producto esta en nuestro catálogo desde martes 22 mayo, 2007.